Our variety of mounting kits let you install anywhere there’s plumbing. Minimize energy costs with fans that run only when needed. Extend the life of expensive hardware with versatile, go-anywhere cooling. Targeted cooling takes the pressure off your building’s A/C system. With a variety of mounting kits available, heat exchangers can be used anywhere there’s a hot spot. To provide the right level of cooling, your heat exchanger's need to be connected to a fluid cooler, a chiller or both. 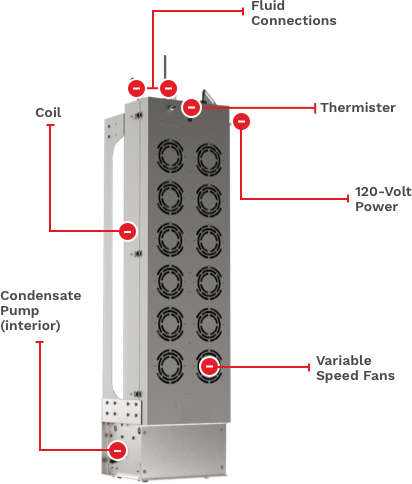 Using cooled fluid, heat exchangers absorb heat from the environment and route the warm fluid through a fluid cooler or chiller to bring the temperature down and start the cycle again.